Following a series of outages that began on September 2nd, Logic Communications advised that efforts are still under way to reinstate their email services to full capacity. 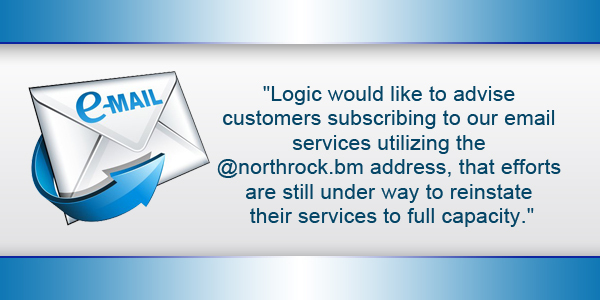 The company said, “As of this notice, Logic would like to advise customers subscribing to our email services utilizing the @northrock.bm address, that efforts are still under way to reinstate their services to full capacity. “On September 2nd, an internet outage was reported, impacting customers that evening and again the following morning, which was fully reinstated within 20 hours. A secondary outage then occurred between the morning of the 4th and late evening on the 5th. “On September 4th email services for @northrock.bm customers were then impacted with services partially restored by late evening on September 5th, resulting in the current degraded service level of delayed email transmissions and slow web mail access. Critical hardware failures were the cause for both service disruptions. “Our team of engineers have been working around the clock to fully resolve the equipment failures”, says Frank Amaral, Keytech CEO. “While we continue to solve the problem, we have a lot of work ahead of us to repair the relationship with our customers. If you’re a business and you’re relying on an @northrock or @logic email address… Then marketing – You’re doing it wrong. If you’re a business and relying on a local email provider you’re making a mistake. So many better alternatives, such as Gmail. I regard the email provided by local ISPs to a be a “token” service, not a serious email solution. Gmail? Really..? Have you read the terms and conditions for having one of those? Alphabet Inc. owns all of your emails. Ok, so this “overdue” statement came out not to benefit the customer, but to pacify the Logic staff who are being bombarded with phone calls? One would certainly think so by reading this statement….dont call us, we’ll call you. Thank goodness I switched when I did. With such bad service for over a week now with northrock email accounts coupled with loss of internet over the holiday weekend, Logic needs to rebate their customer accounts as well as fully recognise that there is a problem on their part with a full apology. With the loss of service over the period detailed above equates to nearly half month of service or should I say- no service. “we have a lot of work ahead of us to repair the relationship with our customers” – here’s an idea: Start by answering the phone. I have not problem waiting, but 20 mins on hold just to be automatically disconnected before reaching an customer service rep is not ok. Please logic, get it together! Frank Amaral, Keytech CEO. “While we continue to solve the problem, we have a lot of work ahead of us to repair the relationship with our customers. “We recognize this statement is overdue and will be providing more frequent updates. You’re not kidding Frank! This very, very late statement is probably the last straw for a lot of people – including me. It is insulting to your customers. THIS IS UNACCEPTABLE FOR THE AMOUNT OF MONEY WE PAY YOU GUYS!!! We still haven’t gotten any breakdown of how the football channels will work or the mysterious “press release” about it. Poor management and no training is offered to employees! Those customer service reps need serious customer service TRAINING! Logic/northrock: you had one job …. ZERO Major Incident Management. Appauling performance for a Service Provider. The Regulator really should be stepping in here to ask what are logic playing at? Notice a pattern here lads? This situation will cause lots of customers to give up and use a global service. Me included. Mr. Amaral, I assume if you read these comments you will NOT be deducting a full month from the subscribes credit cards like you normally do.While you are at it please restore my long distance call back which has been out since April of this year. This was a service I enjoyed for many years under Northrock until you took it over. Northrock weren’t bad by Bermuda standards. Logic are indescribable. Mr. Amaral. If you wish to start mending customer relations – how about an immediate refund of September fees/charges.However doubts continue that you are sincere in your wish. I agree with the posts regarding a rebate of some form for September? I do not use Northrock for our business thankfully! But do for home use age, would very much like to hear from CEO as to what customers will see for deductions for September. I haven’t had Northrock services since Saturday! The customer service is appalling as is their lack of communication to the customer. Ok it’s just gets better, there is NO NEW information on any of the sites they suggest, please go to channel 100, they still have the date as September 1st, today is the 8th and NO information, you can’t expect people to pay really! Northrock tried hard for a small player and did pretty well. Logic bought them and just made a mess. I cant shake the feeling that Logic really dont care if northrock users get frustrated and want to change. The service rep I finally spoke to took about 45 seconds to try and sell me an upgrade to a Logic Bundle. The BRA should really look closely at this incident and draw conclusions about whether Logic handled it correctly at a Management and Technical level. Given that they have bought their way to a dominant and controlling position in the local market ( how did the BRA allow that to happen) they must now accept a responsibility to provide a much higher standard of service than this. The BRA should mandate submission of ongoing service level statistics (uptime, speed, service response) and then create strong financial incentives to discourage Logic from allowing performance to fall below best practice standards set with their rates guiding the metrics. In the meantime, … FIX IT …, and YES, a refund would show that Logic really understands that users have taken a financial hit and they must invest some serious resources in making sure it does not happen again.